Burlap is celebrating their first anniversary, Friday, July 20, 2012, with a party from 10pm until closing. Expect big crowds and a big party! 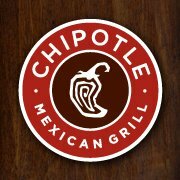 Has it really been a year already, it seems like they just opened! Anyway, you can find them in the Town Center, online at BurlapEats.com, or phone 858.369.5700. If you have a kid who plays soccer, you probably already know the Surf Cup is coming for the weekends of July 28-30 and August 4-6. I read on their website (www.surfcup.com) that nearly 400 teams will be competing, which is something like 5,000 to 6,000 kids, and their parents! So, beware the traffic down near the Polo Fields (El Camino Real at Via de la Valle), and don't think that might be a good shortcut to bypass the horse racing traffic! And, just to make things more exciting, there are horse shows scheduled both weekends at the Del Mar Horsepark, across the street! Only 5 days to go until the start of the horse racing season at Del Mar. The season runs from July 18 to September 5, 2012, closed Mondays & Tuesdays except Sept 3. Information can be found at the Del Mar Fairgrounds web site, and at the Del Mar Turf Club web site. Beware the added traffic on the freeway, but it shouldn't be as bad as the fair! This week's Summer Serenades Concert will feature something different: classical music! 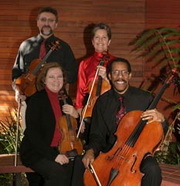 Join us for the string quartet Quartetto Sorrento on Sunday, July 15, 2012 at 5:00 pm at Solana Highlands Park (3520 Long Run Drive). The concerts are free to the public and we encourage you to bring your family and friends and enjoy an evening of music and dancing. Blankets, beach chairs, food and drinks are all part of the ambience that make these Sunday afternoon concerts fun for everyone! All concerts are on Sundays, from 5:00 to 7:00 p.m. The rest of the schedule may be found at the Summer Serenades Concert Page (www.cvsd.com/summer-park-concerts). or download the Summer Concerts Flyer. The City of San Diego has approved a request to put cell antennas on classroom buildings at Canyon Crest Academy, you can read more about it in this Carmel Valley News Article. You can also view the Notice of Decision from the City. CV Internet Line Cut, $250,000 Reward! I don't know if everyone heard about the local internet disruption yesterday (Thursday, June 14, 2012), but it appears that someone cut one of AT&T's internet lines in Carmel Valley just north of the I-5 Del Mar Heights Road interchange. The vandalism caused a good deal of disruption, but mostly north of us. For instance, the San Dieguito School District was out for some time in the middle of the day. If you happened to be near Solana Highlands School that morning and saw anything odd, contact the police and see if you can get a part of that $250,000 reward! Read the North County Times article for complete coverage. Read more about CV Internet Line Cut, $250,000 Reward! With all the fuss about One Paseo, the I-5/SR-56 Interchange Project has managed to sneak by with very little notice. This is a project that will have a major impact on the area, and deciding which alternative gets built will not only cause direct impacts to homes along the freeway, but will also cause indirect traffic impacts, as more cars use Del Mar Heights Road or Via de la Valle. For an overview of the project, see the I-5/SR 56 Interchange Project page, or dive right into the Interchange Project DEIR. The good news is that this DEIR is much better organized than the One Paseo document. The bad news? You only have until July 2, 2012 to submit comments. 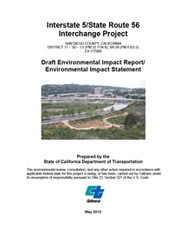 Complete information on submitting comments is available at the I-5/SR 56 Interchange Project page. CV Farmers Market, Now open all year! 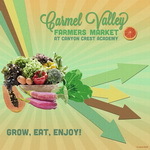 School's almost out for the year, but the new Carmel Valley Farmers Market will continue all summer! Located in the parking lot of Canyon Crest Academy (5951 Village Center Loop Road), the Farmers Market is open on Thursdays, 3:30 PM to 7:00 PM. More information on the CV Farmers Market Facebook Page. Read more about CV Farmers Market, Now open all year! The Towne Bakery (townebakery.com) is now open at the Del Mar Highlands Town Center. I'm not quite sure how to differentiate this new shop from the other bakeries at the center, but it appears to be more of a cupcake store (that also sells meat pies, cheesecake and more.) I guess now you can start at Einstein Bros. for a fresh bagel, run to Starbucks for a coffee or Chuao for hot chocolate, get cookies in Ralphs, a french pastry in Champagne Bakery, rustic bread in Baker & Olive, and a cupcake in the Towne Bakery. You can then catch your breath by the fountain, before running down to the Village Mill Bakery for some fresh bread and donuts. Phew! I think we need to replace Barnes & Nobel with a health club, because I've gained 20 lbs just walking down the mall!